← This is NOT About Lipstick! This clip of Charlie Gibson’s interview with Sarah Palin pretty much says it all. McCain may be channeling Bush, but Sarah is pretty much the real thing … never EVER letting her ignorance stand in the way of her swagger and bellicosity. In far more positive and interesting news, the USWNT will be in Philly tomorrow, playing Ireland in a friendly. Ireland? I know. It seems a rather lopsided match-up, but Ireland did agree to it. Here’s a great article from the Philadelphia Inquirer about how Pia Sundhage found her way to Philly and the WUSA to begin with. Mark Krikorian’s call to Pia was a fortuitous day for US Soccer, indeed! Pia, what are you drinking these days? We owe you a case! And finally, on an even happier note (if that’s possible), HollyCornblog and CharlieHopbrew have been hard at work at the lake, constructing a woodshed that yours truly will be filling with wood (chopped and split by the aforementioned individuals) come November. 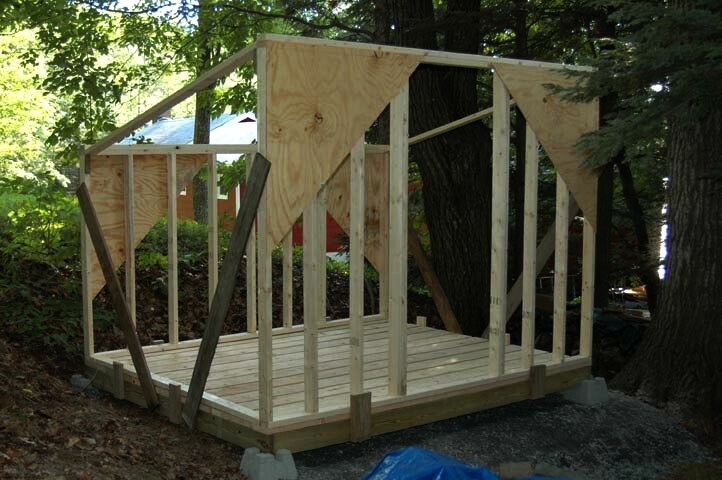 Here’s a photo of their progress as of mid-week … great work you guys! This entry was posted in Politics, Soccer, etc. and tagged Alaska, beer, bellicosity, Bush, charlie gibson, CharlieHopbrew, Condi, Florida State, HollyCornblog, Ireland, krikorian, Lake, Mark Krikorian, McCain, Obama, Philadelphia, philadelphia charge, Philadelphia Inquirer, Philly, Pia, Pia Sundhage, Princess Sparkle Pony, Russia, sarah palin, soccer, US Soccer, USWNT, WUSA. Bookmark the permalink.